If you ever try to use a power bar anywhere but on the floor, you'll quickly realize that gravity will do everything it can to drag it off a table, a ladder, or anything not at ground level. 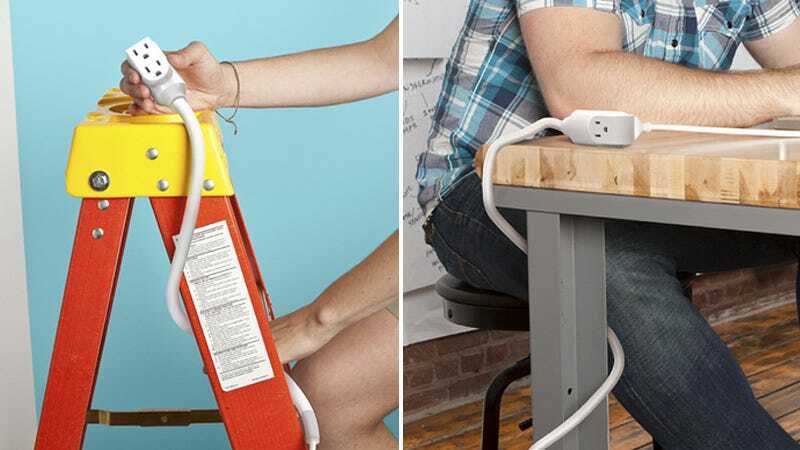 That's not the case with Quirky's new Prop Power extension cord, though. Its six-foot cable is made with flexible wiring and a conforming plastic sleeve, so it holds its shape. That means you can wrap it around table legs, or snake it through the steps of a ladder, and it will hold on for dear life. Unfortunately the business end of the Prop Power is limited to just three grounded outlets, but there's nothing stopping you from daisy chaining another power bar on the end when you run out. And while Quirky promises the Prop Power is going into production, there's no estimate on how much it will cost or when it will be available until they start actually churning them out.